Can you believe we are 12 DAYS from Christmas? I know this for a fact because the boys like to ask me hourly…. I never forget what day it is during the month of December 🙂 The house is finally all decked out and I’m debating whether to put the boxes up in the garage OR just leave them on the floor in the garage since I’ll be putting everything back up in 13 days. Well we are finally getting around to planning this year’s cookie trays and teacher’s gifts and I’m sure you are too. 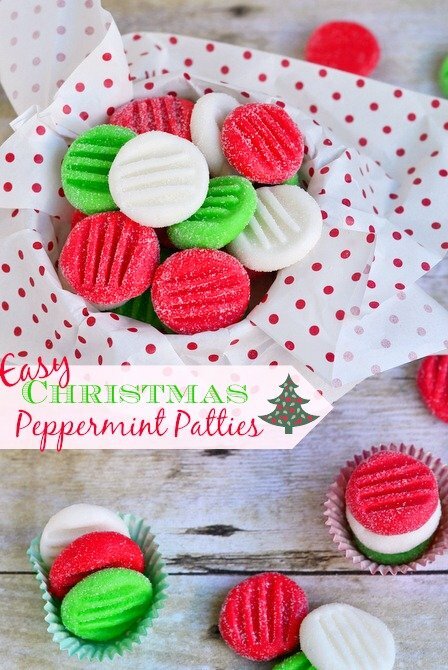 I have the easiest, most delightful recipe to share with you today – Easy Christmas Peppermint Patties. These patties take no time at all, don’t require any baking, use only a few ingredients and are guaranteed to put a smile on anyone’s face. Yes, guaranteed. Now for those of you who aren’t peppermint-crazy like I am, consider using a different flavored extract. 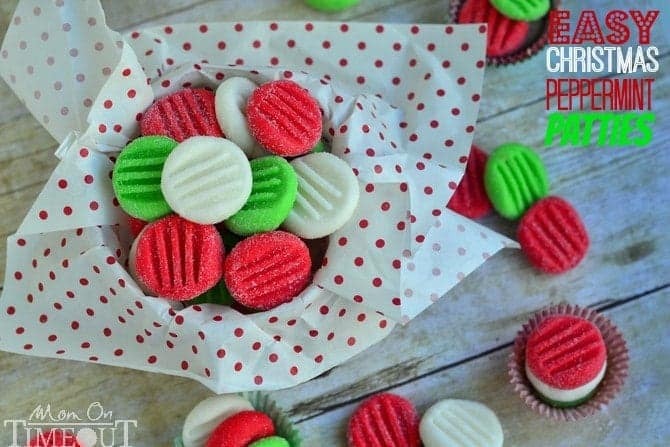 Cherry for the red is always delicious and I actually made the green ones with mint extract which I find to be perfect for Christmas time. The dough is made up with just a few ingredients that you knead together with your hands. This is where you add in the extract of your choice. Start with just a couple drops to start and add more as necessary until you reach your desired intensity of flavor. If you want to do three different colors like I did just separate the dough into three balls.. Or four. Or two. Your choice 🙂 Add food coloring of your choice. I find the gel and paste work best. 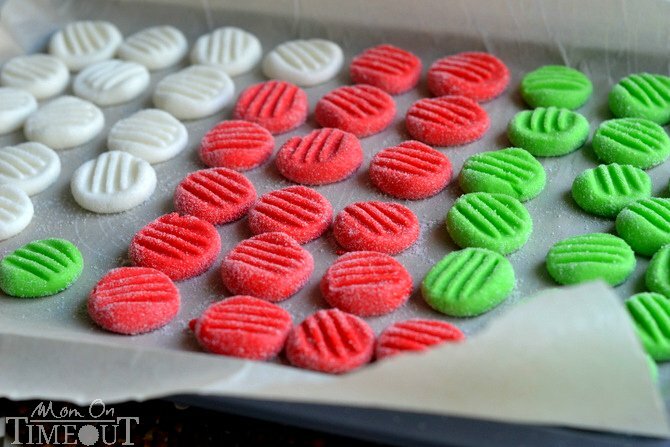 If you only have liquid food coloring you will have to add in more coloring and more powdered sugar so that the dough isn’t super sticky. 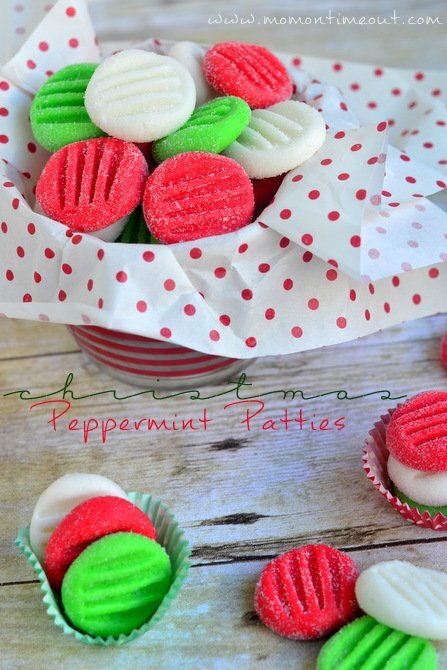 You're going to love this Easy Christmas Peppermint Patties recipe! 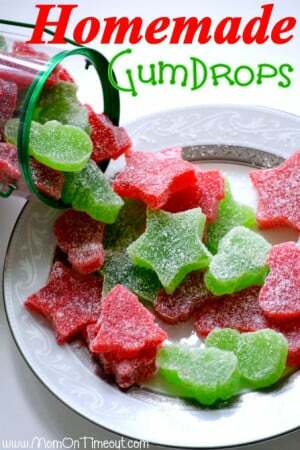 Super easy to make, fantastically festive, and always a hit with kids and adults alike. 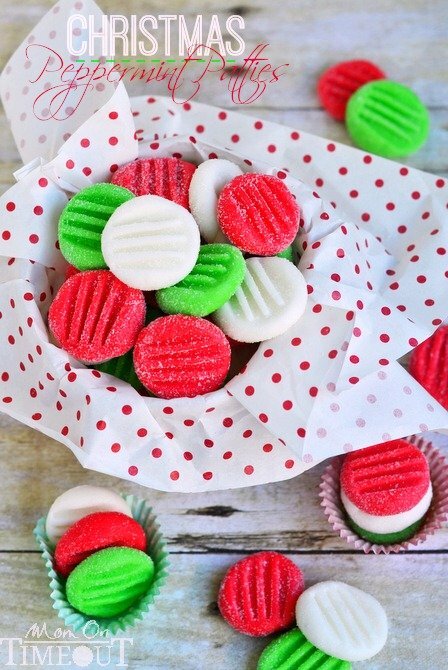 These holiday treats are the perfect addition to cookie trays and make an excellent gift for teachers and friends! 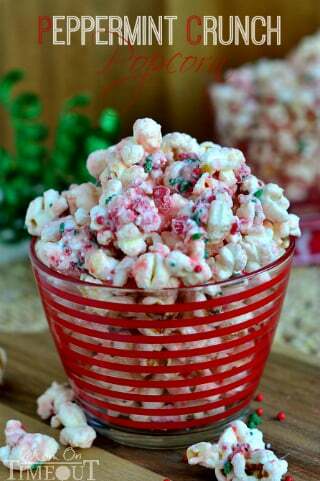 Combine butter and corn syrup together in a small bowl. Stir in your extract of choice. Add 2 cups powdered sugar and mix until well combined. Stir in an additional cup of powdered sugar. Knead the mixture until the powdered sugar is absorbed and the dough is completely smooth, adding additional powdered sugar if needed. 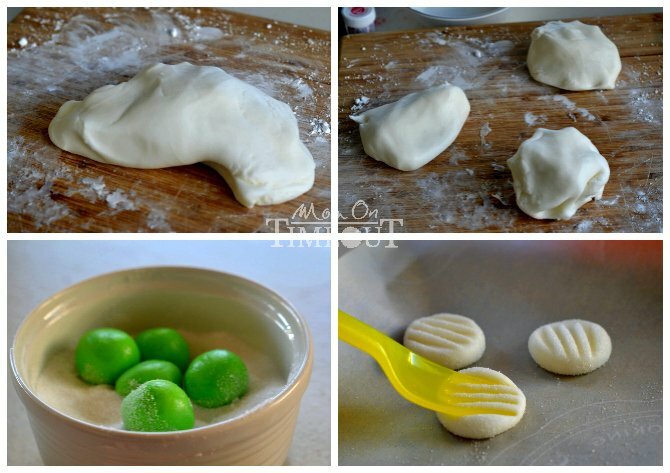 Divide dough into three portions. Tint one portion red with the red food color/gel and one green. Leave one portion white. If the dough gets sticky, knead in more powdered sugar, ¼ cup at a time. Shape into ¾ inch balls and roll in granulated sugar. Flatten gently with a fork. 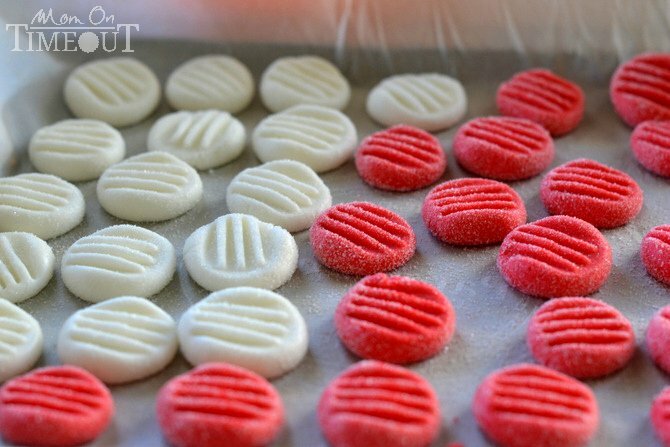 Let candies stand, uncovered, at room temperature for 1 day. 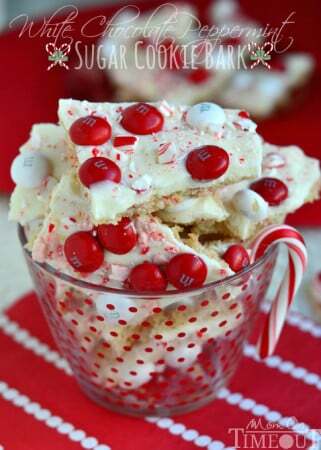 Just made them, they are delicious! Hi! 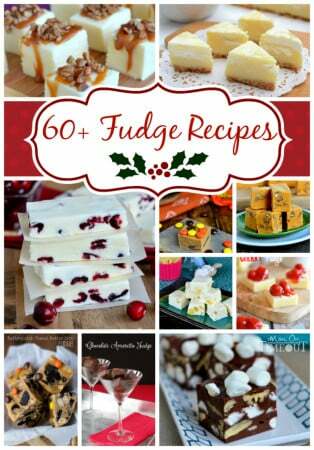 I’m going to try making these tonight but I want to double dip them in chocolate, should I dip them after they have sat for a day or before? Could I just chill them instead of letting them sit?